ello! We’re glad you’re here! We hope you’ll take some time to look around and learn how the Olympic College Foundation transforms lives. Whether you’re a student looking for scholarship information, a donor looking for how we make a difference or an alumna looking for ways to connect, you’ve come to the right place. You’ll find gorgeous photos, engaging stories and fast facts. Our students have amazing stories. Read our student spotlights to learn how support from the OC Foundation has transformed their lives. Take a look at our Impact page to learn more about how the Foundation makes a difference for students, the college and the community. The Foundation and Alumni Association know how to party. Check here throughout the year for events, including our Alumni Speaker Series, art gallery exhibit previews and our upcoming 23rd Annual Community Luncheon. The Foundation awards more than 200 scholarships each year to help students achieve their dreams. It’s easy to apply here during scholarship season, beginning January 2019. 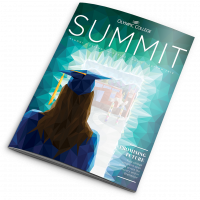 Summit magazine is a great way to learn about outstanding OC alumni, new programs and the latest campus news. Check out our archive of past issues to become an OC expert. If you’re an OC grad, you’re going to want to bookmark our alumni page. It’s the place to read about notable alums, keep up with special events, join the Alumni Association and subscribe to Summit and our biweekly E-News, The Lookout.